Portland is virtually overflowing with craft breweries...more than 60 at last count. To go with those places, there are a growing number of tap houses and related businesses that offer great selections of beer. Given that background, differentiating yourself from the competition is becoming increasingly important. There are varying ways to do this. You see places positioning themselves as sports bars or bike bars or some combination of both. Others lean on the more traditional pub atmosphere without bells and whistles to attract patrons. One of the emerging differentiation points is food. A recent addition to those taking the food angle is the BTU Brasserie on Northeast Sandy, a hop and skip from my house. 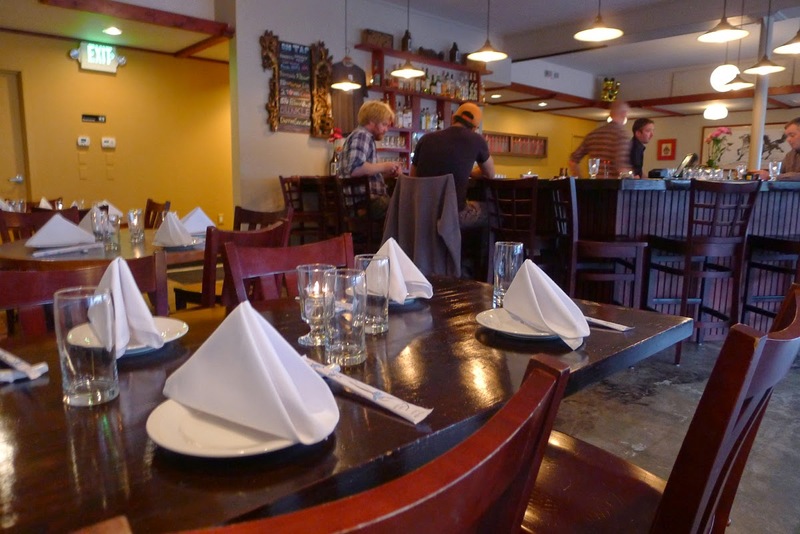 The BTU combines a small craft brewery with Chinese cuisine. They've been open for a couple of months, but have only been brewing for a month or so. 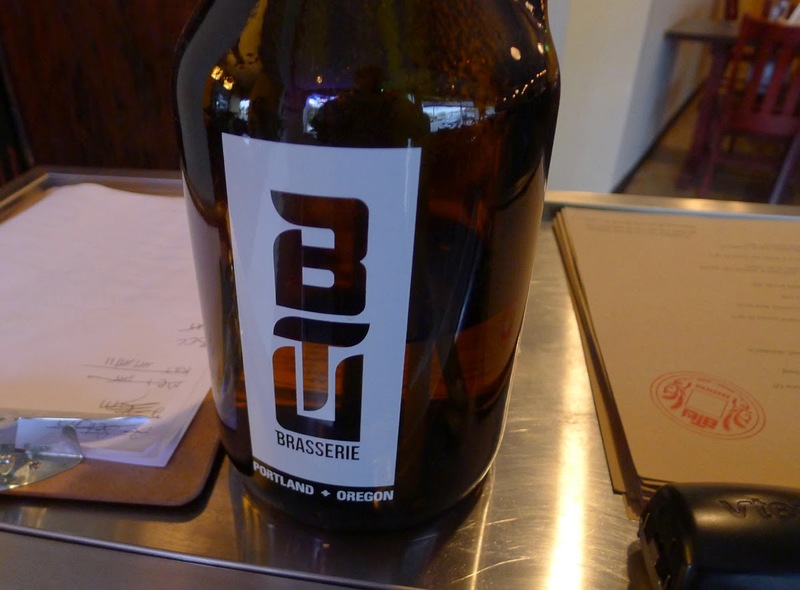 There was a review of the BTU Brasserie in Willamette Week last week. Written by my old buddy, Martin Cizmar, the review gave the BTU decent marks for food, failing marks for beer. As he noted, they have only two of their beers on and breweries often have quality issues early on. Fair enough. I can't comment on the BTU beer or food. I stopped by to take a few photos and confirm the beer situation. Once they get fully up to speed with their brewing, I'll stop by and try to get a bead on the place. If you're headed over there, be advised they have a short, but solid list of guest taps to go with their house beers. Returning to the concept of pairing good or better food with craft beer, it isn't a brand new idea. 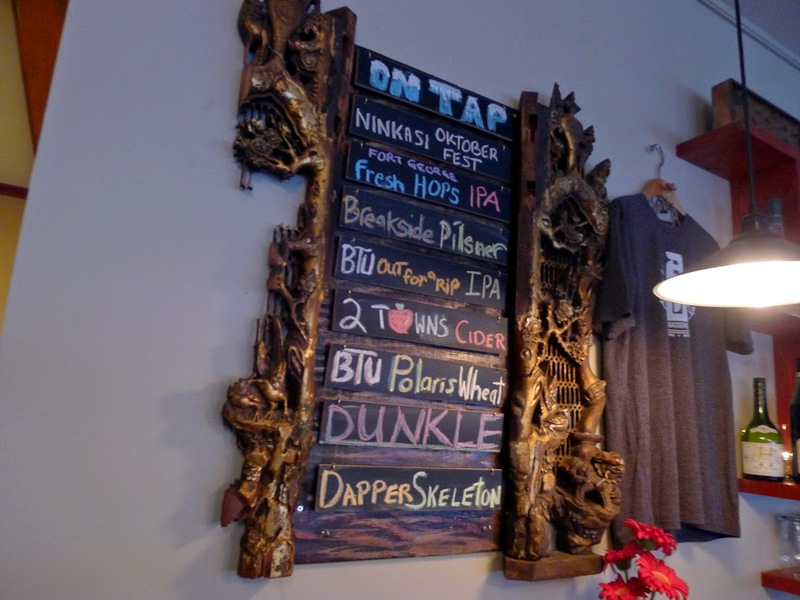 We've already seen it implemented at Breakside's Dekum location, which has a terrific menu. There's also the Tabor Tavern on Burnside, which offers upscale pub food. There are others. Even the idea of combining a brewery with Chinese food isn't new. There appear to be a number of places around the country offering such cuisine via food carts or in-house kitchens. One such place was featured in a fairly recent BeerAdvocate article, which I am unable to find as I write this. You might say pub food has experienced a sort of renaissance in recent times. Early brewpubs had spartan food offerings at best. Most served a mishmash of grubby British pub fare before gravitating to menus dominated by fried food. That approach continued on for years. But change is in the wind. With more beer-centric places opening around town, we are likely to see increasing effort put into developing food offerings that help attract patrons. The focus will be on quality and variety. Places with one-dimensional menus heavy on fried food are going to look rather antiquated at some point. I suspect it isn't just economics driving these changes. We now have restaurant people opening pubs and taprooms. They know food and consider it a priority. That runs counter to the way things were done in the old days, when pubs were run by folks who were passionate about beer, but had little knowledge of or interest in food. Some changes truly are for the best.